Dr. McHugh has over thirty years of urological experience. In addition to managing the common urological diseases, the urologists of Northeast Georgia Urological Associates performs the No Scalpel No Needle Vasectomy, microscopic vasectomy reversals, and minimally invasive procedures of the prostate to include GreenLight Laser surgery and Rezum Vapor Therapy. Northeast Georgia Urological Associates utilize the most recent advances in the No Needle - No Scalpel Vasectomy. Dr. McHugh is one of Georgia's most experienced urological microscopic surgeons and routinely performs Microscopic Vasectomy Reversals at the Northeast Georgia Urological Ambulatory Surgery Center. 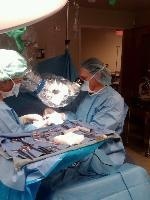 He has performed over 200 Microscopic Vasectomy Reversals. The Microscopic Vasectomy Reversal was performed by Dr. McHugh in August 2013 at the Northeast Georgia Urological Ambulatory Surgery Center, pregnancy occurred November 2013 and the happy result pictured here occurred August 2014. Click on the Facebook icon to Like Us on Facebook. We have a dedicated person now to update our followers about interesting information about our practice and Urology. Julie makes the page fun and informative! Located conveniently off of Limestone Parkway as well as I-365, Northeast Georgia Urological Associates for over 30 years has offered a full range of urological services to include the management and treatment of prostate disorders, stone disease, infections, and female incontinence. The office and adjacent Ambulatory Surgery Center's ample parking and one story facility makes your visit to our practice comfortable and easy without the hassle of downtown Gainesville's traffic. You are never further than 15 seconds from the time you park until the time you are in our waiting room! You can reach us at 770.535.0000 and by fax at 770.532.3911. We are looking forward to hearing from you. You can also contact us at our e-mail address: info@ngurology.com. Dr. McHugh has a particular interest in female voiding dysfunction which includes recurrent urinary tract infections and female urinary incontinence. Interstitial cystitis ( a sometimes debilitating condition of the female that mocks a urinary tract infection) is also an area of expertise of the Northeast Georgia Urological Associates physicians and our Nurse Practitioner Christie Woodruff. Our practice was established in 1980 and has been responsible for providing outstanding health care ever since. Our specialty is in the area men's and women's urological issues. Our patients particularly value our customer service and friendly staff. We are located at 660 Lanier Park Drive, Gainesville, GA 30501.